Last Edit: 2013/12/22 04:26 By Lady Adaira. Last Edit: 2014/01/14 17:55 By silentsoliloquy82. My daughter practice her violin... New songs she doesn't know yet. My ears hurt! Imagine Dragons and Five Finger Death Punch. Hayley Westenra-Across the universe of time. Awesome song. 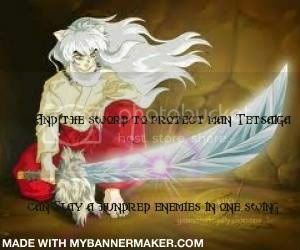 Inuyasha\\\\\\\\\\\\\\\\\\\\\\\\\\\\\\\\\\\\\\\\\\\\\\\\\\\\\\\\\\\\\\\\\\\\\\\\\\\\\\\\\\\\\\\\\\\\\\\\\\\\\\\\\\\\\\\\\\\\\\\\\\\\\\\'s Tetsaiga in the claim game! the song is performed by a K-pop boy group, you can find them on youtube. song is kinda like a south east ballad hymn lovely and yet dramatic song. Last Edit: 2014/01/24 21:38 By TourmalineBlue. "Red Hot" by Vanessa Mae!